Just before the Plenty Highway ends and becomes the Donohue Highway past the Queensland border, we turned left, at Tobermory. For the next 70km or so of unsealed dirt there were regular signs promoting the Urandangi pub. Not that we needed to be tempted but the only pub between Alice Springs and Mt Isa was an offer too good to refuse. Still the humorous signs kept coming at regular intervals with things like “Hot Dusty Road, Ice Cold Beer”, and “Skippy’s Retirement Home”, many on recycled car bonnets. As we approached the town of Urandangie, the car bonnets announced the river crossings and features of the area, “Sally’s Crossing”. “Wallace Rockhole”, “Bill’s Crossing”, “Dinner Camp”, and many more. At the end of the hot day we pulled up at the pub. To my delight there was a tap of Guinness, but this was just another cruel joke because in a town where the population is 7 adults the demand is obviously not sufficient to justify keg beer. As we quaffed our drinks the publican brought out two loaves of bread for the kids to feed the horses. When they returned she led us all out through the pub, through her lounge and into the backyard where a mob of baby joeys pottered around. One particularly friendly one, Chat, who loved a scratch and a cuddle came up to the kids and grabbed them in a tight hold, awaiting a scratch under the neck. He became quite interested in my beard, grabbing it in both paws before landing a kiss on my lips before I could escape. The town was established in 1885 and became a popular stop for drovers on the Georgina Stock route between Camooweal and Dajarra. Even Chinese migrants en route for goldfields stayed and worked here. The publican, Pam, provided us with an interesting summary of the history which provides a good read around the campfire. 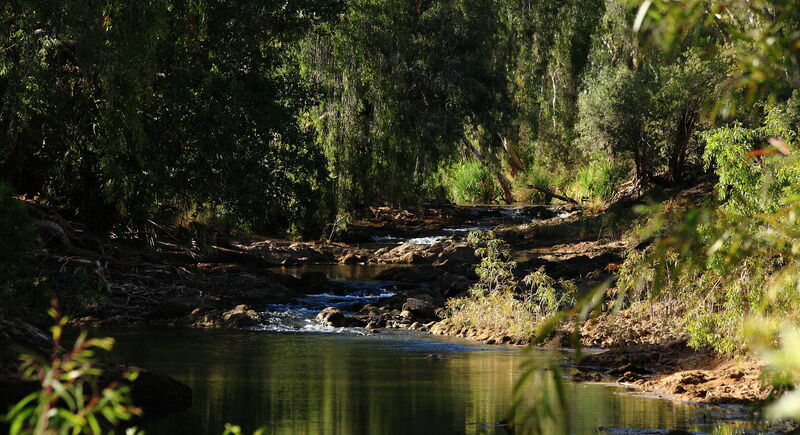 We were then directed back down to the campsites near the river and established ourselves at Wallace Rockhole, where the pools of water looked promising to catch dinner. Unfortunately the only yabby we caught was returned unharmed as it would have only provided a snack for one! The kids did find an inland python sitting on the rocks below the camp. Another beautiful starry night around the campfire was followed by a morning threatening rain. Dark clouds gathered from the West and a rainbow appeared nearby, but as we headed north towards Mt Isa we left it behind. 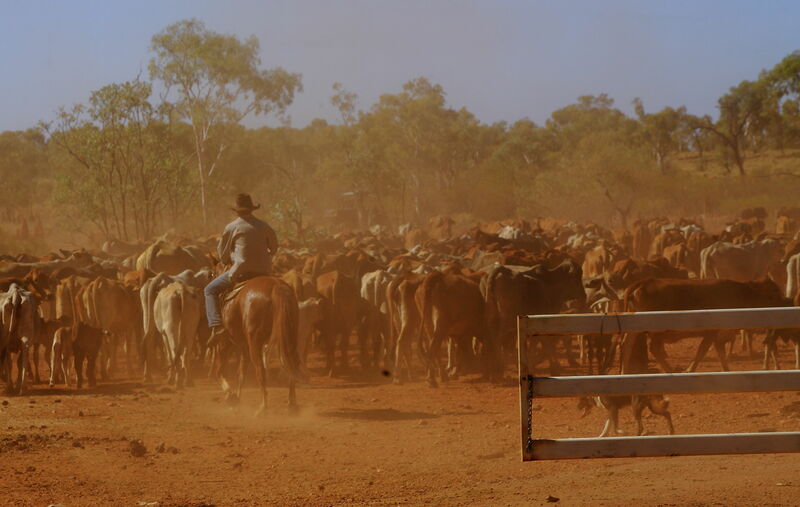 A cattle muster crossing the road provided a temporary diversion from the unsealed monotony of driving. We were greeted by a huge power plant at Mt Isa, and knowing the Queensland National Parks have online bookings we thought it prudent to book a place at Boodjamulla National Park (Lawn Hill). After a lengthy process, more painful than pulling a tooth we found there was only one site we could book for three consecutive nights. Simon booked three different tent sites and we agreed to sort it out on arrival. Funnily enough we never seem to stop long in the big towns to explore and as soon as we have refuelled, restocked supplies we tend to head out as quickly as we can. With the park 390km away we found a beautiful free camp by the O’Shaughnessy river on the way, arrived late in the afternoon for a quick refreshing dip, another campfire and marshmallows for the kids and the melodic bubbling of the river the next to the camp very quickly helped everyone fall asleep very quickly after another long day’s driving. On our return to Alice Springs from Uluru, with plans totally changed we decided to have a look at the Henbury Meteorite crater site. The area is pretty desolate, dry, dusty, very rocky and only small shrubs interspersed throughout the barren landscape. The campsite was fine, right next to the meteorite crater site so a quick exploration was required before sunset. Having seen the gigantic meteorite at Wolfe Creek earlier in our trip I wasn’t expecting much of this place, however it did have a few surprises in store for us. Firstly I was surprised to read that NASA astronauts have visited the site to get a feel for the lunar landscape. It sounded more like a junket to me. The meteor itself smashed into the atmosphere approximately 4,000 years ago, but unlike Wolfe Creek this one split into several pieces, the largest being the size of a 200l oil drum. Four of these pieces hit the ground next to one another while the other eight or so remnants hit the earth some distance to the south (not immediately visible from where we stood). Two of the craters had overlapped into a single large crater, almost 200m across, and the remnants of the walls between them was only visible from spurs jutting into the crater on opposite sides, the fused rock having been more resistant to erosion. Walking through the middle the kids pointed out a “dead finish” bush, so hardy that if it dies then everything else will be dead or finished too. The two adjacent craters were smaller, one quite dry and devoid of plant life, the other quite the opposite. The last crater apparently retains water well offering an oasis for a small stand of trees that occupy the circumference of the base. The base, now dry, was covered in a thick mat of grasses, and a patio of cracked dried mud. When full it must offer a refuge for many birds and animals. With little else to do here it was a good opportunity for Amanda to cook some muffins on the Weber and the kids to catch up on their homework, while I attended to some much needed maintenance on the trailer. The sun set and we sat back to enjoy the spectacularly clear night sky show, with satellites passing far above us in all directions, the band of the milky way stretching across the sky, and a million stars twinkling brightly at us from across the universe. Speeding towards Uluru National Park the next morning we past the “Grismacks” heading in the opposite direction, the last time we will see them on this trip as we head in different directions. Uluru, also know as Ayers Rock, is a massive monolith (single rock) made of sandstone, that erupts from the flat surrounding landscape, famous for its changing colours as the sun sets in the evenings. It is over 400km from Alice Springs and many people, including a couple in our car, mistake their first glimpse of Mt Connor for Uluru. They are actually very different, Mt Connor having a flat top and precipitous walls surrounding it, whilst Uluru is much more rounded in appearance. We had decided to try and climb Uluru and given that it had been windy and closed for climbing in recent days, had crossed all fingers and toes, hoping for a calm day. With the wind definitely increasing as we arrived we filled up our water and headed through the gate. The first section is the steepest as you follow the chains up the side of the monolith. Within 100m Xavier made a sensible decision, given his fear of heights, and decided not to proceed. Shortly after, Hannah muttered something and turned around too. Down to three of us left, Amanda, Oscar (with his visiting school toy, Wilma wombat) and myself we trudged up the calf-punishing rock. We even passed one clown walking in thongs, who lost one over the edge when he finally turned around. Oscar was in fine form and paced onward and upward. Amanda fell back. At the top of the chain an interrupted white line guides you across the undulating top of the rock and after a few short climbs Oscar and I celebrated at the peak with a high five, then photo opportunities with Wilma. We waited for Amanda, waited some more, then with an increasing wind threatening to make the descent interesting we decided to return. Whilst it might be somewhat controversial to climb the rock, the ceremonial sacred sites are actually around the base of the rock, and the local Anangu people’s main concern is that people don’t harm themselves on the rock (over 35 people have died trying to climb it). Having enjoyed walking the 10km walk around the base previously I justified the climb based on the fact I was not disrespecting ceremonial sacred sites. Watching the sunset on the rock with the kids proved a little disappointing as cloud cover restricted sunlight hitting the rock. Next day I was struck with illness so the others headed off to Kaja Tjuta (The Olgas), and the highlight of their trip proved to be the camel farm that they dropped into for a photograph session with Wilma the Wombat. After generously facilitating the photos the girl at the farm let them prepare saddles for the sunset ride, and even gave them all a quick free ride around the yard on the camels. Two hours were spent at the camel farm and only 30 minutes at the Olgas! That evening our plans changed dramatically and instead of heading south towards Coober Pedy again we chose to back-track north, to take the Plenty Highway to enter Queensland rather than the more arduous plan across a number of desert tracks to Dalhousie, Birdsville, all of which will have to wait for next time. Our first night in Alice saw temperatures plummet to 3 degrees. What few warm clothes we had came out but it was actually quite nice as by 9am the temperature had risen enough to be comfortable again. With all warm clothes stowed again we headed out of town along the West MacDonnell Ranges. Knowing it was a short drive for the day we made some impromptu unplanned stops as we went. First up was Simpsons Gap in the Tjoritja / West. MacDonnell National Park. Following the dry river bed towards the gap I was surprised to see “No Swimming” signs but at the gap there was a substantial lake full of icy cold water. A few black-footed wallabies hopped around the rock piles on both sides of the gap, looking down intently watching our every move. We also spotted plenty of striated grass wren jumping around the rocks and grass. A little further along the road we stopped to have a look at the local indigenous artist, Kathleen Buzzacott’s studio. Everyone loved the deep bowls filled with coloured seeds, and running hands through them just felt so good! The kids were interested in the jewellery made from the seeds and then watched intently as Kathleen showed them how to dot-paint. A very interesting stop that inspired the kids drawing efforts that afternoon in the car. Hermannsberg was established as a Lutherian Mission in 1877 by two newly arrived missionaries from Germany. Their trip alone to the area was a marathon of hardships and drought, having being despatched in mid-summer. Today the mission offers an insight to outback life in the late 19th century. The kids marvelled at the size of the porridge pot, particularly as we all ate hot porridge for breakfast. We also learnt that in the indigenous language, Arrernte, there are only four number words, for 1,2,3 then everything beyond this is “a mob”. The kids struggled trying to grasp the concept, but an apple strudel was beckoning us in the café so we moved out of the school. Just on the other side of Hermannsberg a dirt and sandy road led us up to Palm Valley. Having grabbed a campsite we decided to visit the valley before sunset and set off up a very rocky 4WD track to the start of the walk. It was slow and bumpy and the sun was falling fast but we all managed to make the 5km loop walk , then negotiate the track back down before nightfall. The deep-rich red colours of the valley rock walls were amazing to see as the sun dropped further in the sky, and to see Cabbage Tree palms nestled in the valley was interesting as the 2,000 odd palms are an isolated population, their nearest relatives being over 800km away in Queensland. Everyone had been raving about Gunlom Falls and the beautiful natural “infinity pool” views so we decided to overnight on our return from Cobourg Peninsula to check them out. After a marathon day’s driving the dirt again we pulled in before sunset, set up camp and when I realised it was a short but steep climb I set off for a sunset shot. A handful of people were eating snacks at the lookout whilst another handful swam in the fading light but as I looked down the cascading pools I think I was suffering an overdose of falls and pools. It was nice but the water was only just trickling over the falls. The pools were filled with uninviting green algae. Sure the water was clear, an I even went for a quick dip, but I couldn’t help feeling that the Gibb River Road had offered so much more. If this was the first falls I had visited I’m sure I would have been impressed. My glib “overrated” comment to the family was dismissed until the next day when we all returned for a peaceful early morning swim, whereupon I was surprised to get consensual agreement. I noted to myself that this one needed to be revisited in the wet season to give it a fair chance. Before we left I saw a kapok tree adorned with yellow flowers and green pod-like fruit. This is a calendar that the aborigines use to tell them when the turtles are laying eggs, or eggs are hatching, depending upon whether the tree is flowering or fruiting. The seed pods are also used for dying pandanus for weaving, producing a rich yellow dye when boiled. Driving out on the dirt road that morning a wrecked car by the side of the road reminded us of the perils of the unsealed roads, or maybe it was just a victim of one of the feral donkeys that we saw jauntily trotting along the road. Amanda had her heart set on seeing Henley on Todd, a days regatta of fun and hilarity, but all for a good cause to raise money to end Trachoma in Australia, through the Fred Hollows Foundation. In its history the regatta has only been cancelled a few times when the river is actually flowing! The Todd river runs through the heart of Alice Springs but for most of the time the river runs approximately one metre below the sands surface. If you dig down with your hands you don’t have to go far before it gets damp. The commentators occupied an aptly named paddleboat to one end called the Pistill Dawn, and appropriate signage along the embankment indicated No Fishing and Swimming was prohibited due to shark infested waters. The kids spotted a slippery pole at one end of the arena and dashed up with friends to battle it out above the freezing water. The boat races are therefore all across sand rather than water and a plethora of events takes place as the day unfolds. From one person Kayak races to 8 person “Maxi” events, each event progressed with barely time to catch a breath. The boat races were interspersed with sand shovelling contests, a bit gruelling in the hot midday sun, then a surf rescue event where “lifesavers” paddle a surf ski (trolley on rails) through the sand to rescue someone the other end, when two people back on shore wind them back to safety. There were sand ski events, a bit like a three-legged race but 4 people on two skis marching up a course around the marker and back. Of course the turn was the challenge and many a team bundled over at this point. Whilst most of the races involved carrying the shell of a boat in one form or another the Oxford Tubs event looked much harder as two men teams paddled their boats along rails in the sand. There was also the boogie board tow event, sprints, lolly scrambles for the kids, the tug of war, a crowd favourite the budgie smuggler race and the Tour de Todd, where participants race one another inside giant hamster wheels. Oscar tried the latter and drew a collective gasp from the audience when his all fours approach back-fired and he was catapulted into the air landing on his back. Fighting back tears he jumped in and completed the course. The lolly scramble was better for the kids, with each of them collecting a hatful from the arena floor. Hannah even entered the sprints, but missed her age-group heat and ended up competing against kids much older and bigger than her. Amongst all the goings on three teams of Pirates, Navy, and a band of Vikings clad in fur tunics and horned helmets maintained a healthy rivalry in events, sabotaging one another’s teams when the opportunity arose. The Vikings mingled with the crowd wreaking havoc there too. The day culminated with the famous Boat Battle Spectacular, where 4WD boats belonging to the three teams entered the arena for a massive water and flour bomb battle. As the boats sped around the arena, firework bombs discharged debris into the crowd and filled the arena with thick, coloured smoke. The Vikings accidentally set their boat alight and had to spend a few minutes hosing it down. A fun day, and all for a very worthy cause. It is a long drive from Mataranka to Alice Springs, with not much in between, and the major town, Tennant Creek, by all accounts is not worth staying in. We chose to ease ourselves into the cooler climate gently with two stops before Alice Springs. The first day we made a stop in Daly Waters to see the Stuart’s Tree, basically a tree stump with a large “S” engraved in the trunk (clearly visible if you squint both eyes and turn your neck at 45 degrees), supposedly engraved by John McDouall Stuart’s party on his third attempt to reach Darwin from the south in 1861/2. Then we had a quick look at the Daly Waters pub. Every inch of the walls and ceiling is adorned with caps, police badges, bras, foreign currency notes, rugby shorts, and much more. A cold beer would have been welcome but we still had more driving to do. Very close to the town of Elliot, we stopped for the night at a magnificent birding spot known as Longreach billabong. This long waterhole allowed waterfront camping and as we sat there stately jabiru storks, spoonbills, and brolgas strutted along the water’s edge. Meanwhile, darters sunned themselves with wings outspread, and rainbow bee-eaters scanned the sky for their next meal while sitting on dead branches. The sunset was one of the best we have seen on the trip and our fellow travellers from home, Joel and Abelia “Our Roaming Home” finally caught up with us to exchange stories around a campfire. A great finish to the day. Up early the next day, after a chilly night, we set off for Kunjarra (The Pebbles) a sacred women’s site just north of Tennant Creek. The site itself offered little more than a chance to stretch our legs and stroll along a short path through a hillside of small rocks, so we didn’t stop long. Just beyond Tennant Creek is another hillside covered in rocks, but Karlu Karlu, or the Devils Marbles are more impressive and worthy of a stopover. The campsite was very popular (full) but we squeezed in a spot and set off to explore before the sun went down. We all had a lot of fun exploring the rocks, climbing all over them, and Xavier read us the Dreaming stories of the Devil Man, Arrange who spat on the ground, where it turned into the granite boulders that now litter the surrounding landscape. Plenty of photo opportunities kept me busy, even early the next morning before we left. A special permit is required to enter Cape Arnhem, over and above the transit permit required to travel there. Only 10 vehicles are permitted at a time with no trailers, width, height and weight restrictions also exist due to some of the tracks passing through low hanging bush, between trees or over soft sand. This meant having to abandon our beloved home, the Camprite trailer, and pull the emergency tents from the roof pod. We even bought an esky for the trip to keep our food cold. The trailer was parked at Chris and Emi’s house in Nhulunbuy and Amanda was excited at their kind offer to do a clothes wash for us while away. Entrance to the Cape was via a rugged dirt road along an escarpment with glimpses through the forest of beach and mangroves below. A lookout several kilometres in is where the fun starts. Having taken in the views up and down the coastline the road drops steeply down the escarpment into the forest below, weaves through narrow gaps between tall trees before becoming sandy. Taking no chances I dropped tyre pressures below the recommended 20 PSI and pressed on. Without a map there were a surprising number of trails leading off, though most of them return to meet, and without too much difficulty we headed in the right direction. There are over 50 sacred sites on the Cape, the main one known as Twin Eagles, where visitors may drive by but not stop to picnic, camp or fish. The drive north up the Cape involves beach and dune work, sometimes particularly soft and there was plenty of evidence of “boggings” along the way. The sandy beaches looked attractive on approach but our hearts sank somewhat at the volume of sea-borne debris and detritus that littered most of them. Then sadness turned to dismay when we spotted a bottlenose dolphin washed up on the beach. We pulled over and dashed to see if we could save it but it looked like it had only recently died. Not knowing what had killed it (no obvious visible cause) we paused and walked down the beach collecting thongs (flip flops for those reading in the UK) that covered the sand. Over one hundred were recovered and placed on the car roof. Most of the debris has been brought from Asia by prevailing winds and ocean currents, or dumped from ships passing. We found a campsite known as the Penthouse, at the furthest point north that visitors are allowed, set up camp and then found a dead turtle on the beach below. Some rangers had obviously stayed prior and had enjoyed a feast of mud mussels and turtle eggs, judging by the discarded remnants on the edge of the camp. A small crocodile swam in to shelter behind the reef as the rough ocean was still being stirred up by strong easterly winds. The hammock was brought out and we switched into relaxed desert island chilling mode. The kids explored, we fished (Oscar was happy to catch a queenfish) and Amanda sat in the hammock reading. The next day we wanted to make a further impact and we chose the same beaches, this time targeting cigarette lighters. Over 300 were retrieved and disposed of. The children were somewhat distracted by their search for Chambered Nautilus shells that they had started to find but all helped fill the bucket. We noticed the difference but we couldn’t collect all the ghost nets, toothbrushes, light bulbs, and a plethora of miscellaneous glass and plastic bottles, jars and other items. And all the time the winds were bringing in new items. We found two more dead turtles too on the beaches. Others had obviously tried before us and had left the debris in a tree. We chose to dispose of it. On returning to camp Xavier found a fossilised chambered nautilus in rocks nearby making us all ponder how long these animals have been around, long before humans polluted these beaches. The sandy tracks allow a couple of days exploring. To the south there is another camp near caves beach and whilst folk do swim the crocodiles are there as we saw so extreme precaution is recommended if entering the water. Despite the rubbish on the beaches this is a great place to escape and experience the beauty of Arnhemland.